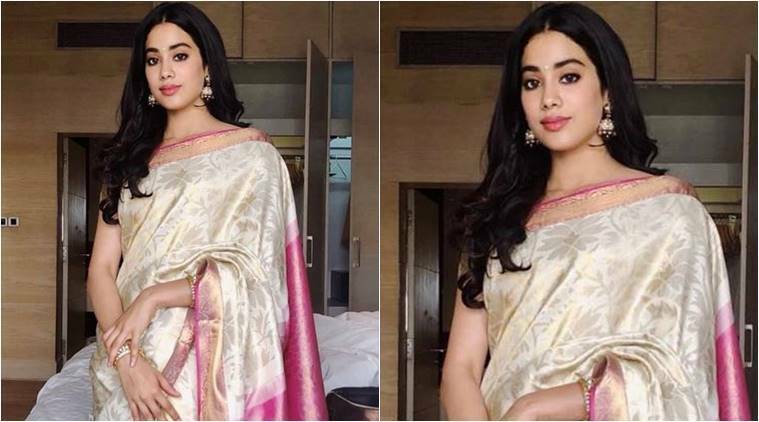 Janhvi Kapoor stepped out in Sridevi's personal sari to collect the National Award for Best Actress for MOM on her mother's behalf. In an ivory and pink sari, the starlet looked lovely. Check out the pictures here. While attending the 65th National Award ceremony in Delhi, Janhvi Kapoor was spotted wearing a sari from late Sridevi’s personal collection. The 21-year-old, who collected the Best Actress Awards for MOM on her mother’s behalf, looked lovely in the ivory and pink textured sari with a soft gold border. Accessorising with a pair of matching jhumkis and kadas, the starlet kept it simple yet elegant and we can’t help but think of the grace and elan with which Sridevi used to carry her saris. For the make-up, Kapoor went with dewy tones, a pink-tinted lip shade and soft kohl-lined eyes. A silver bindi added elegance to her ethnic ensemble and she rounded out her look with hair coiffed into soft curls and parted in the middle. We had seen the actor arrive in Delhi yesterday and then too she had kept her look simple and comfy in an all-white ensemble. In a soft white shirt, paired with flared pants, the actor added a pop of colour to her look with a denim bag in blue. With lavender sandals, minimal make-up and her mane of soft curls parted in the middle, Kapoor gave us some goals in casual summer dressing. What do you think about the actor’s sari look? Share your thoughts in the comments below.